The K-pop phenomenon has surpassed borders for years, thanks to the quality of their artists and their music, and 2017 hasn’t been the exception. This year has been an amazing year in music for K-pop listeners, considering releases of huge artists, such as G-Dragon, Girls Generation, Twice, EXO and BTS, among others. Since the year is about to end, I thought of doing my Top 10 Albums of 2017. Note: I also included mini-albums, since I honestly don’t care about how many songs the album has, but rather the quality of the music and vocals. Completely written by the members of BTOB, their first release of 2017, Feel’em, includes elements of dance pop. The funky vibe of their title track, “Movie,” shows a side of BTOB that is not seen that often anymore, opting for a funny and joyful song about making a girl fall in love with them (I can confirm it surely worked for their fans). It was written, produced and arranged by BTOB’s own member, the main rapper Jung Ilhoon. Another remarkable track is “Someday,” the breathtaking ballad that shows the power of their vocal line, and it was also written, arranged and produced by a member of BTOB, this time Im Hyunsik. The international act released their fifth mini-album Love Yourself ‘Her,’ and it debuted on the Billboard 200 at No. 7, making it the highest entry for a K-pop act ever. That being said, let’s admit the album has quality songs, apart from the title track “DNA” that became an instant hit. Tracks like “Mic Drop” (that was recently remixed by Steve Aoki) and “Go Go” show the power of the hip-hop oriented concept that represents their style. Most tracks had the lyrical contribution of BTS’s rappers RM, Suga and J-Hope, and the outro “Her” was produced by the group’s go-to producer, Suga. While lyrics are surely their forte (just ask ARMYS), the album stands out for their electro-pop and hip-hop sound. Taemin is unquestionably one of the biggest male figures in K-pop, and his second full-length album came to prove it. Taemin is a man of many talents, and even though he is usually known for his dancing skills, the whole album proves that he can sing, and hell, he can sing very well. While Move is more of a dance-oriented track, with a choreography that he describes as “middle ground, mixing both masculine and feminine movements[..],” the song “Rise” shows the power of his vocals, and “Thirsty” shows his natural sexiness. The record is definitely a memorable and quality one. Gfriend, just like Twice, have only two years in the industry, yet they’ve gained extreme success. As if the original version of this mini-album Parallel wasn’t good enough, Rainbow came and stole the crown. Including the hit “Love Whisper” and other tracks like “Ave Maria,” this repackage starts with the lovely intro “Belief.” Track seven “Falling Asleep Again” shows the softness of both the vocals and music that Gfriend can provide, and the extra songs, “Summer Rain” and “Rainbow,” are a great addition. “Summer Rain” is a beautiful song about love that, as always, has a powerful choreography to match (or contrast) the sweetness of the music, while “Rainbow” could’ve been a good title track any day; it begins with the inspiring quote, “nothing is impossible,” and — as any Gfriend record — is a dreamy experience. The second mini-album, by global star G-Dragon, is an amazing follow-up to his previous, critically acclaimed work Coup d’Etat, released four years earlier. G-Dragon is unquestionably the biggest male figure in K-pop, and so is Bigbang as a group, so it’s no surprise that this work is found here in this list. He was obviously involved in the lyrics and music of the whole record, and it is probably his most honest work to date. The album, although short, is just enough to make people feel the lyrics he wrote. Even though most of us probably haven’t felt what it is to have fame and riches, the rawness and honesty of the lyrics make the audience feel instant empathy while dancing to the rhythm. The title “Untitled, 2014” is a song about breakup, regret and the urge to be with one’s significant other and is in many ways relatable. In this album, G-Dragon doesn’t show his stage person but his most vulnerable, sensitive side as Kwon Ji Yong, the man. Fair winner of the 19th Mnet Asian Music Awards as Album of the Year, The War proves (if anyone needed the confirmation) that EXO is here to stay (and slay). The album mixes elements of R&B, hip-hop and pop that go well with the powerful vocals of the members, specially D.O, Chen and Baekhyun who fill the listeners’ ears with well-executed high notes and pleasant riffs and runs. The rappers are also a great addition as it fits the whole style they were going for, and for the date the album was released, the whole album but especially the title track “Kokobop” are the perfect summer anthem. Tracks like Diamond and Chill are the perfect harmony between the vocals, the danceable rhythm and the energetic raps.The complete album is a must hear for everyone who hasn’t been enlightened yet. (Apologies for Kai’s CA). October was truly a blessing for everyone, including me, as three of the 10 albums were released in October, and two of them on Oct. 16. BTOB reappears in this list with their second full-length album, and it shows again how BTOB can pretty much do anything. While rappers Ilhoon and Peniel even get to have singing parts, this record explores the versatility that BTOB truly has. Starting as a group with a dance-pop oriented path, with tracks such as “Wow” and “You’re so Fly,” they have turned into one of the most powerful vocal groups in K-pop and are well-known balladists. Following that road, they came back with their title track “Missing You,” written, composed and arranged by BTOB’s Hyunsik. The album has the format of a concert, with tracks that mix their joyful side like “Blowin’ Up,” written and composed by the vocalist Hyunsik and the main rapper Ilhoon, and the naughty “Guitar” that uses many metaphors (Rapper Peniel expresses “he’ll hit that G precisely”). It also includes their specialty — calm tracks full of vocals and heartfelt raps such as “Running into Breakup” and “Dreaming.” It ends with the song “Finale (Our Concert),” which is dedicated to fans. All tracks have the contribution of the rappers in their respective lyrics. This album pretty much has everything: variety, lyrics, raps and amazing vocals. If you reached this point and wondered where the hell Taeyang was, here he is. G-Dragon’s bandmate, the main vocalist of legendary group BIGBANG, also released a record — his third studio album that came three years after Rise. Taeyang is (honestly) not my favorite member of his respective group, but this record is genuinely my favorite from 2017, and it’s sad that it practically got snubbed from certain awards. It starts with the intro “White Night,” a fan favorite, and the fact that it’s just one minute and a half long is still tragic, but as they say, quality over quantity. 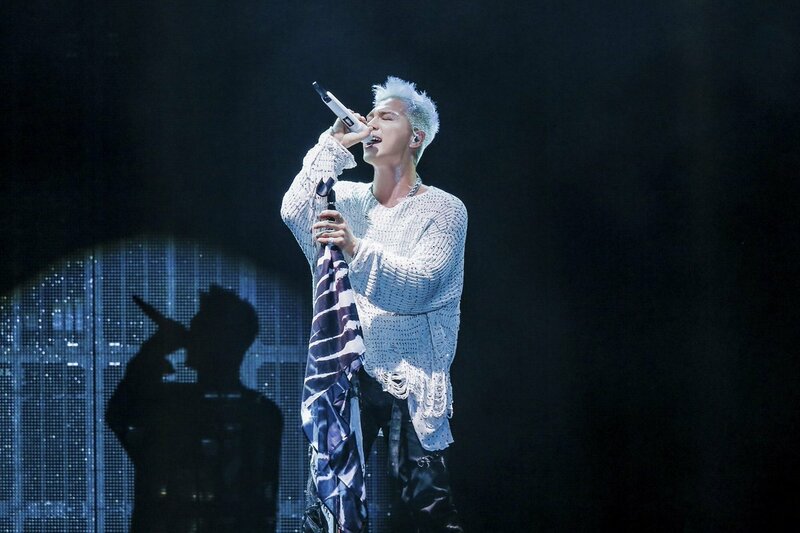 In “Wake Me Up,” Youngbae asks himself “is it love,” while filled with a dream-like atmosphere. “Darling” shows sensibility for one’s significant others’ actions and claims, while the tracks “Ride,” “Amazing” and “Naked” show his upbeat, danceable side. With the song “Ride,” some fans even claim it has some sort of Michael Jackson vibe, which could never be anything but a compliment. “Empty Road” is filled with soft vocals, until the climax, when Taeyang’s powerful voice comes to light. The last song, “Tonight” — featuring one of the best rappers in the K-pop industry, Zico — is undoubtedly the best way to end such an album, with the instrumental of this song being dreamy. The addition of Taeyang’s heartfelt vocals (especially at the end of the song) and Zico’s rap results in one of the most enjoyable experiences in music, no lie. Involved in the writing process of five out of the eight songs, the whole album flirts with the R&B sound he usually goes for, and it’s one of those works you couldn’t get tired of, even if you wanted to. That’s what a beautiful voice singing with emotion can do. Those are my Top 10. Comment your thoughts and your own picks!